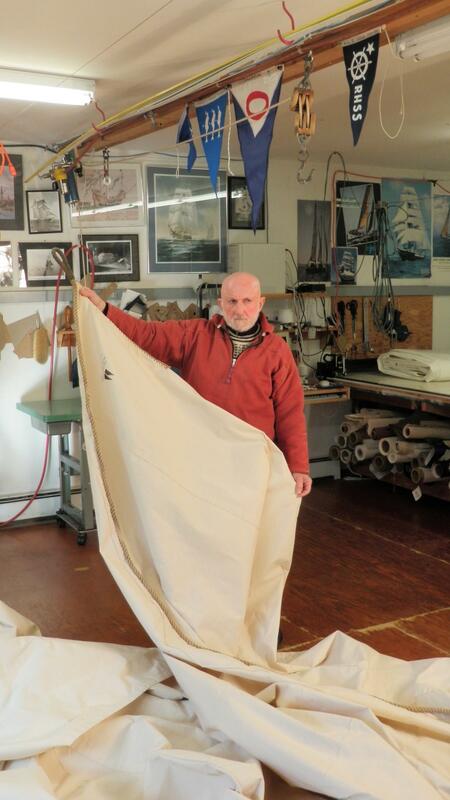 Louie Bartos holds up part of a completed sail. A restored Bristol Bay double ender will highlight a new exhibit at the Alaska State Museum in Juneau when it re-opens next spring. The exhibit will display artifacts from the maritime history of the state. The boat came from a man in Homer with many original parts. Ellen Carrlee, a conservator with the Alaska State Museum, said the boat came with two original sails. As part of the exhibit, the museum will use the sail of the boat as a screen to project images and video of double enders being used in Bristol Bay. But Carrlee says they won’t be using the original sails for that. “Not only is it kind of dirty and used and the images wouldn’t show up very well but if over time we projected light onto the same rectangle, we would fade and deteriorate the sail in that area. And we weren’t willing to damage the sail,” said Carrlee. Enter Louie Bartos. Bartos is a sailmaker. The 79 year old Ketchikan man began sailing when he was only 10 years old. Over those decades at sea, Bartos has mastered the craft of replicating the old style of sail making. Bartos got his knowledge from a scruffy Scandinavian sailor. “I got a good foundation in rope work and so on and so forth. And I asked him all the time making a repair on a sail and then he would go into how it was done in the old days,” said Bartos. Bartos spend as much time with this sail master as he could. He said he acquired his knowledge by doing and by watching. Ellen Carrlee at the state museum quickly tapped the craftsman to recreate a sail to match the original that could be used for the exhibit. Bartos examined the old cotton sail, paid close attention to the stitching and the material used so he can match it as closely as possible. 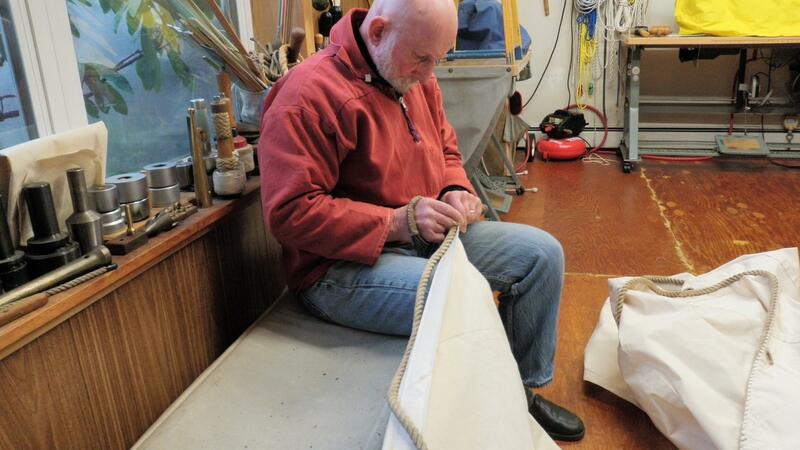 Working quickly, it takes Bartos about two weeks to complete a sail. He says sail making today is very different from what he learned as a kid. He used to be able to look at a sail and deconstruct how it was made and then make his own with the same design. He can’t do that anymore. Today’s sails are all synthetic material with computer generated designs for the best aerodynamics. The craftsmanship is different. A close friend of Bartos told him he should write his knowledge of sail making down before it disappears for good. That quite large volume is already 900 pages and Bartos isn’t even done writing it yet. The boat is getting a new sail but it’s not getting a new paint job. This double ender was stripped to get refinished so it’s not painted. This double ender is from the Libby McNeill & Libby fishing company that operated in Bristol Bay in the early part of the 20th century. Libby painted their boats orange. The museum has decided not to paint it that original color but leave the raw wood exposed. Ellen Carrlee believes that look will be better for the exhibit but not all agree. It’s been a debate between boat purists and non-boat purists. Carrlee says they could always paint it later if they decide that’s the better option. There are still a few pieces of Bristol Bay double ender history that are missing from the exhibit. Carrlee is hoping to get them before the exhibit opens next year. So if you have any of those hidden away in your basement or garage. The Alaska State Museum in Juneau will gladly take them off your hands.